Three real talents contested the 1980 British F3 title, Stefan Johansson, Kenneth Acheson and Roberto Guerrero. Johannson started the year in a Marlboro Project Four March 803 and developed a points lead until Acheson swapped his 803 for an older and easier to drive 793 and became the man to beat. Guerrero then took up the chase in the works Argo JM6 and each had won five races by the season's July/August break. The momentum swung decisively when Johansson took delivery of a Ralt RT3 and swept the last four races, snatching the title by just two points from his two rivals. 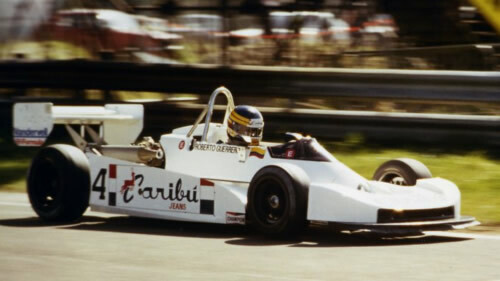 Although the ground-effect RT3 had shown promise in 1979, none were raced in Britain at the start of the season and March 803s were numerically dominant. But the 803 was a very new design, based on the ground-effect F2 792 design, and it took some time to get it working properly. A mid-season update kit transformed it, but the reputational damage was done and March's grip on Formula 3 was significantly weakened. Points table from Autosport 20 November 1980 p32. Almost everyone used Toyota engines, but Dave Price Racing and the works March team tried Alfa Romeo engines in March 803s. A Titan-built Chevrolet Vega was used in another 803, and an old Triumph Dolomite engine appeared in an older March. The 1980 results have been compiled by Chris Townsend using the main British magazines Autosport and Motoring News. Race and qualifying results are largely complete but entry numbers are not known for the three late season races: Oulton Park 18 Oct 1980, Thruxton 26 Oct 1980 and Thruxton 8 Nov 1980. Please get in touch if you have any F3 entry lists, programs or official results hand-outs.